Does the expression “larger-than-life” bring images of Mt. 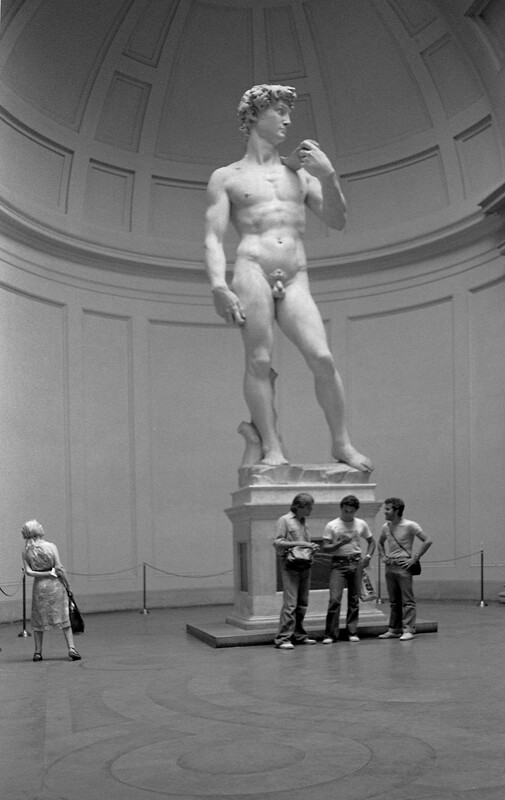 Rushmore, the Statue of Liberty, or Michelangelo’s David to mind? This term is often used to describe the scale of public art, designed to impress viewers with its grandeur even alongside natural wonders or city scenes. Yet “larger-than-life” can also refer to someone’s reputation or personality. “Larger-than-life” may even refer to the impact such a famous or impressive person has on the lives of others—his or her legacy to future generations. 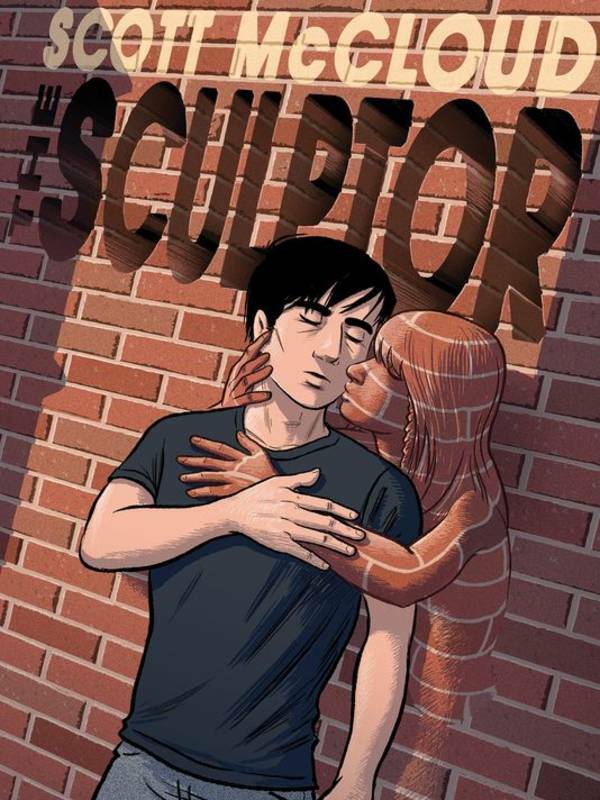 These multiple meanings are on my mind today, as I ponder my family’s recent interactions with artist/illustrator Scott McCloud and his brand-new and truly wonderful graphic novel, The Sculptor (2015), a fierce yet poignant look at what it means to create art. This early gift surprised and delighted me. (“Dedicated to me!” I still squeal, “And with its own, drawn-on-the-spot cartoon of a girl, my very own Scott McCloud ‘avatar’!”) And it did arrive just in time. Portland was one of the first stops on McCloud’s nationwide tour promoting The Sculptor. My copy came just a week or so before McCloud nearing the tour’s end visited Macalester College in St. Paul, Minnesota. Since the college is just minutes from my home, of course I went to hear him speak. I surely would have bought my own copy then, though I suspect any autograph I stood in line for that day might not have had that lovely little personalized cartoon. I think being told by Daniel that the book was for his mother, who is also a fan of comics and graphic works, McCloud might have taken some extra moments for the doodle I now prize. How McCloud behaved, along with what he said when he spoke at Macalester, relates directly to The Sculptor’s plot and themes. 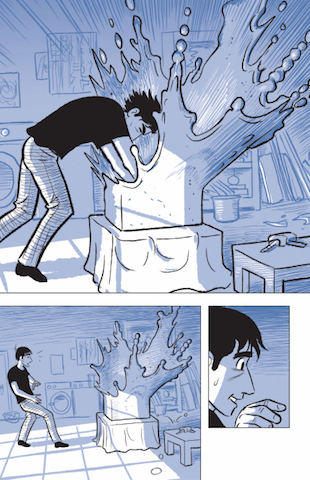 Its 500 pages depict how much its central character, 26 year-old sculptor David Smith (not—as this young man points out—the renowned mid-century sculptor also named David Smith) wants and sacrifices to achieve the kind of recognition accorded these days to Scott McCloud. McCloud’s own reputation had drawn an audience large enough to fill Macalester College’s student union auditorium, even in subzero weather. 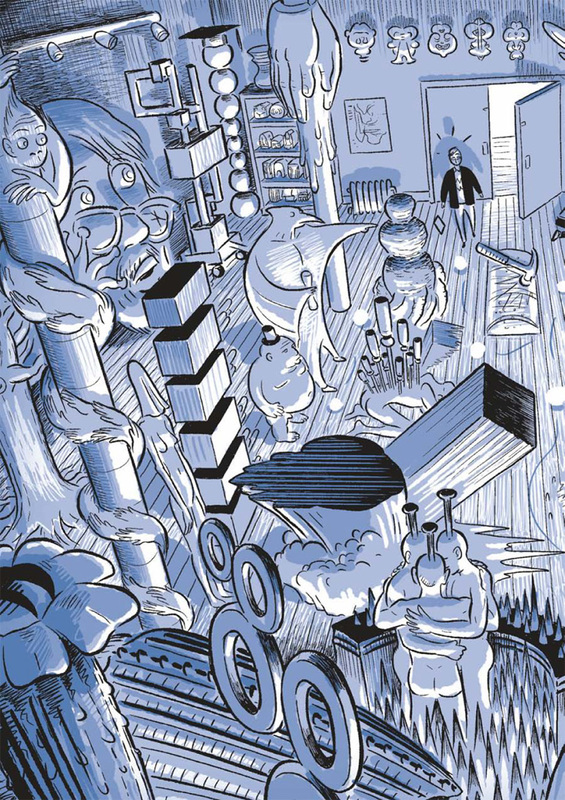 Surprisingly, though, this giant in the world of comics is in person not at all “larger-than-life.” Soft-spoken, dressed informally, and relaxed in demeanor, McCloud conversed easily with Eric Lorberer, the editor of Rain Taxi Review, who interviewed him. Despite his relative fame, McCloud remains modest about his drawing ability compared to other artists and earnest and friendly when answering questions from the crowd. This seeming “disconnect” between fame and taking pride, power, or total satisfaction in artistic success is at the heart of The Sculptor. 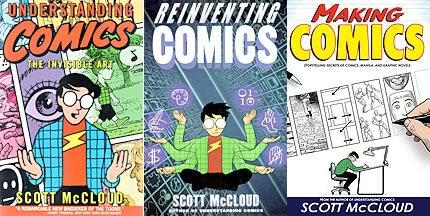 Its young protagonist makes an incredible sacrifice for his art that today’s 54 year-old Scott McCloud proclaimed he would not. Explaining how his wife and own life had inspired characters and some events in the novel (an explanation detailed further in the book’s Afterword), McCloud said The Sculptor is a mature, rueful look at youthful aspirations and singled-minded ambition. It is not the book McCloud would or indeed could have created in his 20s, when its plot first occurred to him. Described as an “anti-fantasy” by one reviewer, The Sculptor is in simplest terms a variation on the legends that inspired Goethe’s Faust. Instead of selling his soul to the Devil for knowledge, though, McCloud’s hero makes a bargain with Death. On his 26th birthday, David Smith—scorned by art critics after some early success—accepts an offer from Death: Smith will be given a superhero’s powers to sculpt with his hands, to create the “big, monstrous, beautiful things” he sees in his mind, “demanding to be seen, demanding to exist,” but in return he will have only 200 more days to live! Death, which appears to Smith as his departed Uncle Harry, shows the young man the quiet joys (and frustrations) of family life he will be giving up with this trade, but Smith still opts for artistic achievement and fame. What he does not reckon with is how slowly and capriciously artistic worth is acknowledged in today’s world and how his view of this bargain will change when he falls in love. 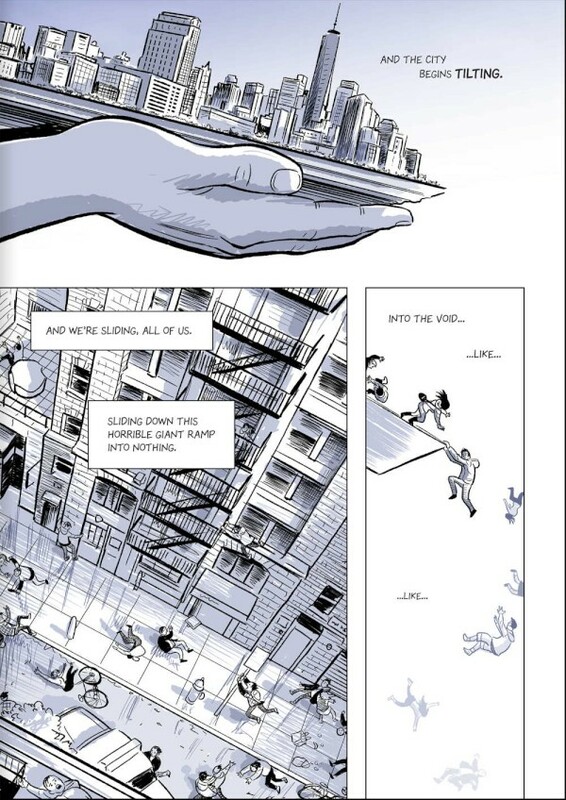 McCloud’s graphic storytelling elevates this familiar and somewhat predictable plot to breathtaking heights—literally as well was figuratively, as much of David Smith’s art is monumental in size, scaled to New York’s cityscape. 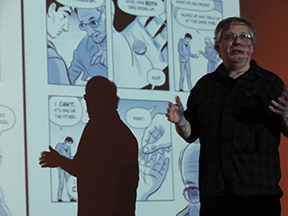 McCloud uses wordless or nearly wordless pages to great and varied effect. They provide the novel’s mysterious, attention-grabbing opening; in double-page spreads show the frenzy of focused artistic creativity; and in multiple-page sequences capture both the dilation and compression of time during moments of great emotion. This powerful novel (best suited to readers teen and up) depicts the intimacy of love-making, the despair of clinical depression, and the imagined experience of dying. McCloud’s palette of blues, blacks, and greys—through subtle variations in tone—conveys a shifting range of emotions and experiences. For instance, when David Smith is asleep or unconscious, an entire panel or series of panels is black. As he slowly awakens or regains consciousness, his fuzzy-headedness is suggested by grey word bubbles, their remarks displayed in soft-focused lettering. At other points of angry intensity or action, large, thick black letters sweep slantingly across pages. Loud sounds or raised voices are also marked by changes in letter size and font. Yet anger, despair, or grief are not the dominant emotions in this book. Equally there are joy, hope, humor, and the gamut of feelings associated with falling in love and becoming a family. McCloud’s fine ear for dialogue as well as his drawing skills make us believe in the world of David Smith and the characters who inhabit it. Boldfacing some dialogue establishes its natural rhythms, as when David first unexpectedly encounters his uncle and says, “Well, great to see you!” as he embraces him. This synergy between words and images is constant. For instance, David’s girlfriend Meg never actually says she is pregnant when she reveals this news to David; in three panels she does say, “I . . . haven’t been . . . real careful about . . . birth control . . . .” Her expression there, combined with the looks between her and David in the following three wordless panels, as well as in the panels and pages that follow, convey the range and scope of David’s reactions to this news, knowing as she does not that he has only eleven days left to live. Here as throughout The Sculptor, McCloud varies close-ups with mid and far-range views and changes in perspective to great effect. In dying, David Smith will leave not only warm-hearted, quirky Meg (whose independent spirit extends to rejecting medication for depression) but the “family” of her friends who have also embraced him. Theirs is a multiracial, multicultural community, celebrating birthdays, backgrounds, and the holidays of different religions in realistically varied economic circumstances. Economics and class differences also figure in the studio and gallery spaces of the art world friends and acquaintances who are another part of the life Smith has traded for his magical hands. New York City and its heterogeneous population are themselves characters in The Sculptor, with its many scenes of urban life round-the-clock. In his St. Paul talk, McCloud spoke of travelling to New York just to photograph the inhabitants of different city neighborhoods, to have true-to-locale models for the background characters he then drew. This attention to detail is evident throughout the novel, but has added poignancy in its breathtaking, heartrending conclusion. I will not “spoil” this conclusion with comments on its specific images or dialogue. I do suggest, though, that you reread the final three pages and note again the placement and content of the lone panel on the book’s very last page. The Sculptor will remain a “larger-than-life” part of my personal library. I plan to keep my son’s early birthday greeting–handwritten on a torn-out, lined notebook page—inside my gift copy of this book. I confess that it means a great deal to me—not only the care and thought that went into this present but the fact that my husband and I have been able to transmit our love of reading and art to Daniel, now 28 years-old. It is part of our “longer-than-life,” intangible legacy to him, together with whatever else he will remember about us. 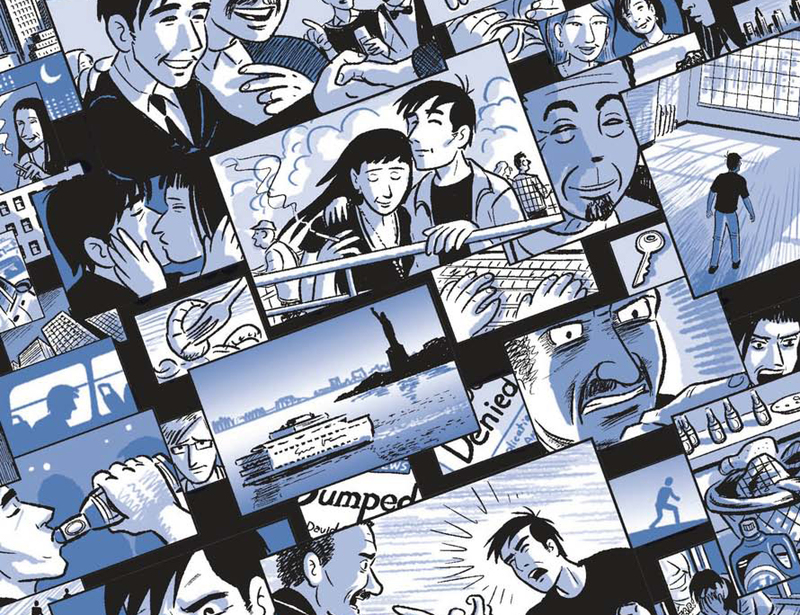 We (now older than Scott McCloud) have lived our lives with family, literature and art placed ahead of any modest professional fame we managed to achieve. Even without such a personal note but especially with it, The Sculptor is a wonderful testament and tribute to our multicultural family’s values. This entry was posted in comics, graphic novels, Uncategorized and tagged art, art world, autographed copies, book tour, Chrome guide, David Smith the character, David Smth the sculptor, Eric Lorberer, fame, Faust, galleries, graphic storytelling, Macalester College, Making Comics, monumental sculpture, New York City, Portland Maine, Rain Taxi Review, Reinventing Comics, Scott McCloud, St. Paul Minnesota, studios, The Sculptor, Understanding Comics, Zot!. Bookmark the permalink.